The Pre-alpha Combat Tech Demo has been released! This means everyone that has pre-ordered Eden Star will be be finding a download key in their inbox soon, and you’ll be able to play before Christmas! The Combat Tech Demo was designed to be a fully playable, enjoyable snapshot of the core game mechanics of Eden Star. You’ve got awesome physics-based combat, being able to throw around enemies like toys, blast them out of the air, throw one straight into another, and take them down by throwing crates at them. You’ll be fighting the robotic Ika Drones. These training drones are programmed to attack you, your Eden Kit, and any gun turrets you build. Watch out for their ramming attacks, and when they land, their automatic weapons can do a lot of damage! The Ika Drones will attack in waves, giving you a little time in between in which you can gather minerals, repair your base and your Eden Kit, construct defences and prepare for the next! You’ve got a basic version of our Construction system, enabling you to materialise structures with ease, using resources manufactured from the minerals you’ve gathered throughout the destructible world. Our Cornerstone mechanic allows you to place blocks at any angle, so you can build complex structures at any orientation! You can also build powerful gun turrets to defend your Eden Kit. These robotic sentry turrets will track and destroy any Ika Drones within their range, so long as there are resources in your Eden Kit to power them! You have a slow-mo ability, enabling you to perform amazing feats of John Woo-style slow-motion carnage! You have a range of freerunning abilities; able to mantle up destructible environment without limitations, using wall-running to cross large gaps, fighting as you power-slide your way to victory! Eden Star is not your typical first-person-shooter, so we have included a tutorial to show you what you can do, and how, using both keyboard and mouse, and controller. Control mapping can be viewed at any time in the menu. A warning before you play, however: The Combat Tech Demo is Pre-alpha, and as such, may still have some bugs. We have tested and refined as much as time allows, and we’re confident that the game runs smoothly on most systems, and is still really fun to play. The Combat Tech Demo represents the last iteration of Eden Star we are able to do in Unreal 3! All development from here on out is going to be made in Unreal 4. Because of this, we will not be releasing patches for The Combat Tech Demo, so we can focus solely on making an excellent full game. Recommended minimum specs for running the demo are listed as follows. We hope you’ll have a good time with The Combat Tech Demo and that it will give you an impression of just what we’re capable of in UE4, and what Eden Star can become, with your help. Have a great Christmas, Pioneers! There’s only 2 days left to vote on Indie DB’s game of the year awards! Please help us towards the top! A quick reminder to everyone, and news to those of you who may be new to Eden Star: the Alpha is now available for pre-order via our site! 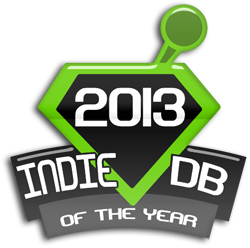 Once again, please vote for Eden Star on Indie DB’s game of the year awards! Working on something ultra-top-secret that’s very exciting and we want to tell you, but can’t… Sorry.